Involve those impacted/affected, including the community, (i.e. victim, family, neighborhood, school, offender) in the resolution. Evidence that demonstrates the program provides meaningful invitations to participate (e.g. more than one personalized contact attempt. A single form letter would not demonstrate this). Evidence that demonstrates that the program actively involves participants in understanding the harm and related needs as well as their ideas and input in determining the agreements/outcome. Evidence that demonstrates the program actively involves the community in the response to the needs illuminated/harm experienced by all parties. Encourage appropriate responsibility to address needs and repair the harm. Evidence that demonstrates the program ensures that the participants acknowledge responsibility for the harm caused. Evidence that demonstrates the program provides opportunities for the person who caused the harm to develop an understanding of how his/her actions affected others. Evidence that demonstrates the program facilitates the development of agreements that directly relate to repairing the harm as defined by those directly affected—victim and offender. Acknowledgement and repair of the harm caused by, and revealed by, wrongdoing. Evidence that demonstrates completion of agreements focused on repairing the harm. Evidence that demonstrates satisfaction among those harmed with the outcome of the process used. (This was first posted on Howard Zehr’s blog. Jon Kidde wanted to make sure that is was noted: this work is adapted from and influenced by Howard Zehr’s blog). My personal reflection: In an attempt to be constructive and critical. Clarity around the last section… “Restoration.” What does that mean? For my work it means restoration of relationships. This could be the “rebuilding” or “building” of relationships. In schools it is essential to focus on the restoration between teachers and students. This relationship will set up students for success or failure. 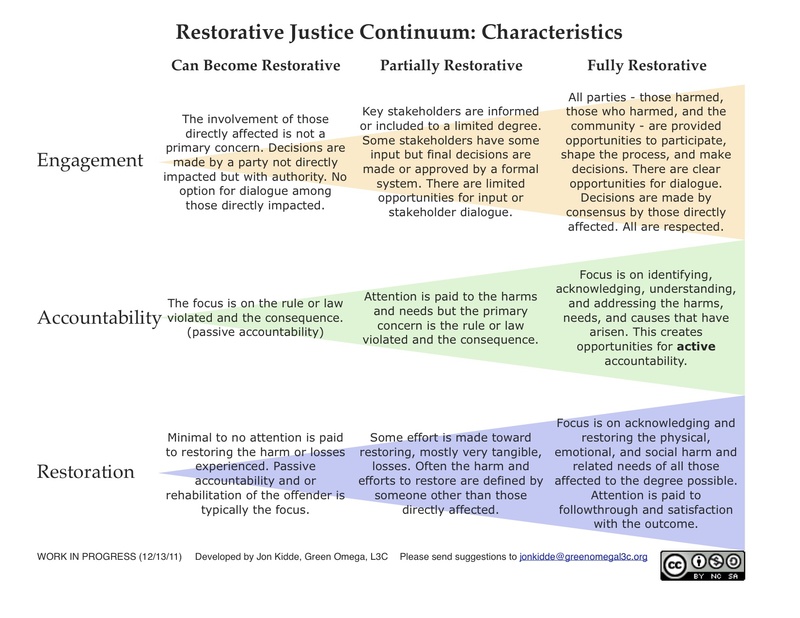 Beyond this critique I find the discussion regarding what is Restorative Justice essential. The fidelity of practice is something the RJ community needs to be focused on. As schools, juvenile justice, and other youth serving programs seek to implement RJ practices they will need to have some guide regarding the richness of their systems. I hope we can come together to support high quality RJ systems. This entry was posted in Opinion or Personal Account and tagged implementation, Jon Kidde, Restorative Justice, RJ. Bookmark the permalink.